DreamHost is ending support for email catch-all addresses. The following provides background information and instructions on how to retain any catch-all messages that currently exist. 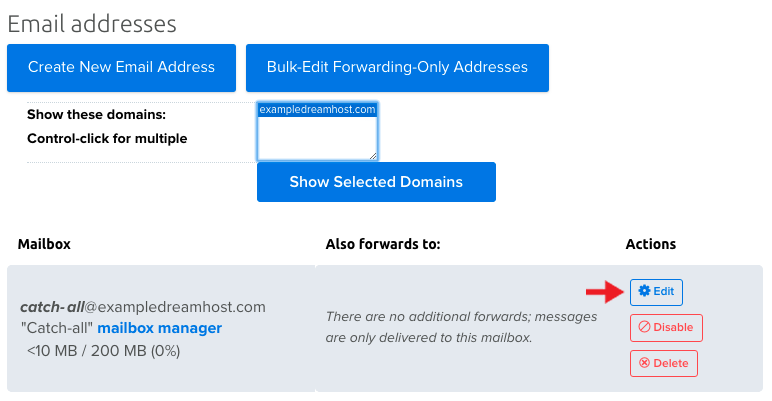 On October 1, 2018, DreamHost disabled catch-all email address functionality for all new and existing domains. Shortly after this date, existing catch-all mailboxes and their messages will be deleted from DreamHost’s servers. Catch-all forwards were also be disabled. A catch-all email address is a specialized mailbox on a domain that will “catch all” messages that were addressed to the domain, but do not match any specific email address or alias that has been created on the domain. For example, if you have an address of contact@example.com but someone sends an email to contactt@example.com, the catch-all address would still catch the misspelled address and you'd receive the email. Without a catch-all address, incorrectly addressed messages would bounce back to the sender and never be received. However, since catch-alls offer 100% deliverability for all possible email addresses on a domain, they are a frequent target for spam, and often receive an overwhelming volume of junk messages. Additionally, legitimate senders who mistype an email address will receive no indication that their message has been routed to a catch-all, so they will not know they should revise and resend their message to reach the intended recipient. A catch-all address is a fully functioning email address that you can log into and view email that it received. A catch-all forward address (also known as an alias) only forwards email to a fully functioning address. You cannot log into a catch-all forward to view email. You can only log into the address it forwards email to. How can I keep my catch-all email intact? If your catch-all address receives email (meaning it's not a forward address), you can convert it into a regular email address (without the catch-all functionality). By doing this, you can retain any existing catch-all email messages that were received in the past. Navigate to the Manage Emails page. Select the ‘catch-all’ email mailbox you wish to convert, and then click the Edit button. Email Address — Replace the existing ‘catch-all’ address with a new address name. Mailbox Login — Do NOT make any changes to the Mailbox Login address. If you select ‘generate a new one’ from the drop-down list, a new empty mailbox will be created and your existing catch-all email will be deleted. Mailbox “Name” — Optional. Enter a new name for the mailbox. After you edit your catch-all address to become a new address, your previous catch-all address will lose its catch-all functionality. When finished, scroll down towards the bottom and click the button. Why is DreamHost removing catch-all addresses? Because they don’t reject any messages, domains with a catch-all attract an overwhelming volume of spam. This degrades performance of the mail system for all customers and delays delivery of legitimate messages. Additionally, DreamHost’s Vade anti-spam servers cannot be enabled on domains with an active catch-all address, so the large volume of spam messages sent to these domains cannot be filtered or blocked. Finally, when a catch-all mailbox is forwarded to an external email address (either directly from the catch-all or through an intermediate account) DreamHost’s mail system gets falsely identified as a spammer by a number of global blacklists, negatively impacting the outbound deliverability of all customers’ email. Will this affect catch-all mailboxes or forwards? Yes. The entire catch-all functionality is being removed, so this impacts both mailboxes and forwards. How can I create an alias on my email address? DreamHost email accounts allow the use of ‘disposable’ or ‘on-the-fly’ email address aliases, where you can instantly generate a unique email address based on an existing mailbox. These kinds of aliases are useful for tracking whether a particular website has shared or leaked your contact information, or for proactively categorizing email signups at various websites. Mail sent to any of these addresses will deliver to jim@example.com. There is no limit to the number of aliases you can create in this manner, and they require no setup ahead of time. This feature is already enabled on all DreamHost email accounts. Where can I find more information or support? How can I create multiple forward addresses at once? When catch-all addresses are removed, any email sent to a non-existing address will not be delivered. However, you can create as many forward addresses as you like in the panel. In this way, you can catch a lot of email that could have been misspelled. View the following article for instructions on how to create multiple forward addresses at once. Article last updated March 24, 2019 17:15 PST.